First things first: Tempeh (pronounced TEM-pay) was first discovered in Indonesia (then the island of Java) by a Dutch botanist named Rumphius in 1747. However, it appears to have been around for centuries, possibly in the neighborhood of 2000-4000 years. It is mentioned in the Serat Centini, written in 1815 but based on older sources in the 1600s. The Serat Centini is twelve volumes of collective stories, passed from one generation to the next in Javanese culture that addresses issues from romance, medicine, mysticism, Sufism, history, literature, agriculture, forestry, astronomy to spiritual values of Javanese society. According to Tempeh Girl Amy Amoroso, who spent time in Indonesia, tempeh is still consumed daily. The unfortunate thing about tempeh is that it’s not very pretty. But it’s the inside that counts, right? The fermentation can resemble mold, which is off putting so keep in mind that the health benefits of tempeh are numerous. When you hear about longevity and soy, it is NOT processed soy products like soy milk and soy cheese that longevity enthusiasts are referring to, but rather the fermented soy like tempeh, soy sauce, natto and miso. You can answer your friends’ and family’s ever-lasting concern about where you get your protein: “Tempeh is high in protein.” It has a whopping 15 grams in a half cup! 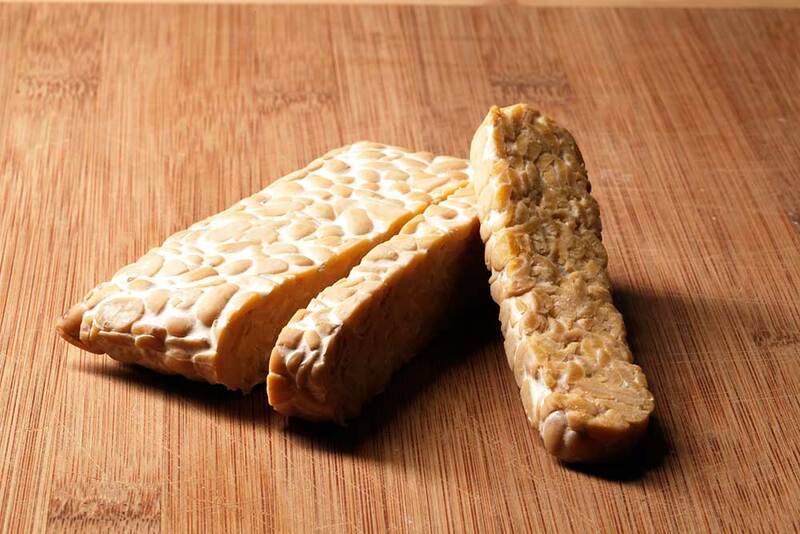 Tempeh ranks a 9 on the glycemic index – out of 250 being the highest so it’s friendly to your sugar levels. It’s high in folic acid – good for pregnant mothers–and has a fair amount of calcium as well! BALANCE – our guts balance the good bacteria with the not so good – fermented foods help keep this in check. If you have ever been told that you have IBS, yeast infections, allergies, asthma – adding in fermented foods could help increase the good bacteria to help calm down these conditions. DIGESTION – You know how a mother bird regurgitates food for her babies so it’s easily digestible for them? Well, fermenting our food, and tempeh is a fermented food, is like partially digesting before eating. Hope that doesn’t gross you out! ENZYMES – Fermented foods are rich in enzymes, the building blocks of protein. Enzymes serve as the catalysts to breaking down your food. It has been hypothesized that if we could protect against enzyme depletion, we could possibly live longer (and happier!). Think of enzymes as digestion guardians.